I hope you will find this site and information it contains to be of interest to you. If you need help just ask. SECURITY. I have problems with Viagra sellers, spell binders and witch doctors contacting this website !!! So for your security, any email addresses sent to this site are only ever visible to myself. I will only pass them on with your permission. New updates on Guestbook Page and obituary page. Anyone remember Audrey Ledgerwood 1941. New in Gueatbook entry. New Guestbook entry----50's/ early 60's. His name was Norman Allbright (Shiner) and his brother was Robert Allbright. (Bob)50's/ early 60's. Had an email from John L Hall ,Brownrigg 1960, this morning. If you see this John it’s to let you know I did send a return reply. But your email address bounced back as invalid. Our website attracts people from all over the world who are interested in Brownrigg School. I have had contact from the USA relating to a schools Summers Activities Programme, which sounds a bit likea mini Brownrigg School. A couple of boys from the school George and kenneth have come up with an article on building a Log Cabin, and it looks like this might be a project!! Well at Brownrigg we lived in Cedar Wood built cabins so lets see what these young people can create. Group Photo of Tweed Dorm 1949 from Robert Snowball of his father and one other named. See it in the 1940s photos. If you know anyone else in the photo let me know. Can anyone help? Please send any information to me via the website and I will pass it on including any email adresses , (more secure). This weeks Womans Weekly, 8th May, has an article in about wartime evacuee centres and Brownrigg is mentioned with photos. New message in Guestbook from Ashington . 2nd photo added from Bryan Cole. Tyne Dorm 1940s his father and Raymond Hindhaugh also mentions Lillian Hinhaugh at Brownrigg. New photo in the 40s his father in (villain) school play, supplied by Bryan Cole. If you know anything more about the play please add it in Guestbook. New appeal in Guestbook 1953 -54 era. NEW PHOTO ADDED from Patrick Hendry 1969>70s ----see photo section. Recognise anyone? If you do let me know their names Left to Right. New photos of early 50s ? Sent in by Dave Walton (father John Walton, Blyth), now in 50s photos, have a look. Anyone know him? Any comments welcome, or contact I will pass on to David. Today On BBC national and local news, the story of ex Brownriggers Eddie and Sydney Grahams search for their fathers wartime grave. The story is also in the Evening Chronicle. I will when able add a link, just for now I am having problems with the link. New photo in 1940s, Anyone comment on exactly what year of 40s. Know any faces? The photo was sent in by Peter Chrisp who's mother is Jean Law , she's in the top row 4th from left. Two new entries in Guestbook. 1970s. One international from Germany, please take a look. New appeal for Charlton 1959 anyone help? Terry passed away this morning. For those of you who new my brother Terry Yarrow , 1957. Terry is in Wansbeck Hospital Palliative care, terminally ill.
i will post any updates here. 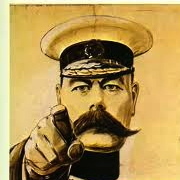 New appeal for an identification in the Guestbook pages, Have a look at the question there, then check out this photo. Now open to all, "The Brownrigg Story" page. Anyone have any information on ----Bede Lyons 1940/45--------See "Guest Book"
Apologies to anyone who contacted the Guestbook for my delayed responses (now added), but it's been one hell of a year with technical difficulties and family commitments. Also I thought maybe there would be a little interest in this website since the demise of the reunions + contact via Facebook and other sites. Anyway I have decided to keep it going so it should be here for some time yet. Anyone who can remember Joe Raine, one of the former Heads of Brownrigg,----- has died December 12th aged 93. Announced in todays Newcastle Journal. Funeral is to be held at Whitley Bay Crematorium, Tuesday 22nd December at 13.30 hrs. Friends please meet at the crematorium, family flowers only, donations in lieu, if desired to be made to the Sir Bobby Robson Foundation. A donation box will be available at the crematorium. Back from my wanderings now and hope to do some catchup on the site. Anyone want a ready made home in Bulgaria? See the new page ---Homes for Sale. Rosie and I have decided to move nearer to my daughter who lives 20 kilometres in another village, so our house in Bulgaria is up for sale. Houses like this, modernised for UK residents are hard if not impossible to come by. So if you want a low cost holiday home or permanent residence, take a look. Any other ex Brownrigger can add a link to their "House for Sale" on the same page, just send me your details. If you have any photos or stories for the reunion page send them in. Just added some photos from Pat Batey onto SKYDRIVE. 1/.Go to the 2014 Reunion Page. Just back from the "LAST Reunion" and will add lots photos and stories for you on the Reunion Page very soon. In the meantime Gordon & Margaret Robson from Western Australia, who were at the Reunion, have added their email address in "Guestbook" So if you need to contact them their it is. YOU MAY BE ABLE TO GET HOLD OF YESTERDAYS ISSUE, WHY NOT TRY. We have, at last, got a two page article in today’s Tues 3rd June issue of The Chronicle. It’s in the Remember When bit, right in the middle of the paper. Going to THE REUNION 2014 ? Names now entered for 1954 dorm photo. I recently had contact with Jack Dawson, formerly of Ashington and now living in Birtley. Jack has sent me a copy of the 1954 group photo with Mr James and Ron Peer in the centre which was already on this website. But, best of all, it included the names of everyone on the photo and I think this is thanks to Harry Platter, who is also on the photo. Thanks Jack. Remember if you have photos/names please send them in and I will record them. 1/ I have recently come across an interesting American High School Website (Class of 59) and have written to them to ask if I can place their link on here. It is well designed (I wish I had the time and inclination). Hope to place it here for your enjoyment and interest shortly. St Cuthberts News Letter No 5 added. I have moved the BRS Reunion 2013/14 news to where it is more obvious in the side column, and renamed it 2014. From now you will find there all the latest reunion news as it happens. Also question from-- Ken Brownrigg---Any idea how the School got its name? As far as I know the school is built on the land known as Brown Rigg. I checked with Eddie Graham and he recollects the name is written on maps dating around 1800. I think there are other Riggs in the area all possibly related to the Scottish --Rigg (Furrow) or being the earlier name for Ridge. Unless anyone knows anthing else? A question from George Ryan; Can anyone remember when Brownrigg Started taking in children with social problems, was it sometime in the 70s? My brother Terry Yarrow and I were given priority applications back in 1957 as our mother had died some years previously. So in a way this was a family problem having a father who had to go out to work, this was the same for lot's of kids at the time but even more so in this day and age with high divorce rates. Answers and comments please on "Guestbook Page." Recently had correspondence from Gail Mcbean 1981/85 concerning these latter years of the school. Gail rightly pointed out that although Brownrigg took children with social problems, giving them a stable structured environment this was alongside the normal intake of pupils. Also interestingly, the normal intake of pupils included many from military services backgrounds, whose parent/s were serving in places such as Northern Ireland and Germany. The cost she said, " dad paid £400 a month for me and my sister and the army paid the rest, a lot of money back then! Horse riding at brownrigg used to cost £7 a week, certain kids got it for free,I was also in the scouts but that had nothing to do with the school." New hello from former sick bay staff member 1969 in Guestbook. Guestbook----New hello from Gail McBean (Avison) 1981-85. Great to have any photos of that time (the last years of the school) if there are any out there? I'm back. I hope to catch up with news of the book and may soon have more photos to upload to the site. THE BOOK is now at the printers. As promised some photos from 1965/7 names to follow shortly. Added an aerial photo of the school. (With the compliments of 41Sqn). I wonder how many times we were photographed from the air as an RAF aerial practise. The layout of the school was so like a small army barracks, so I suppose it would make an ideal object to photograph. The upshot is we have a great record of the school. Thanks to the RAF. Also shortly adding some much needed photos and names from 1965-67 from Shelagh Kent. So if you are from that era, this may stir some memories and maybe even some photos that you have gathering dust. Send them to me, they could appear on here and certainly will end up in the Heritage collection at Bellingham. Hello all, I can reveal the last donation towards the cost of the new book came from The National Parks, see below. There would hardly be a single ex BRS pupil that did not use and enjoy some part of the countryside around the school either before or after this area became a National Park. We were delighted to offer a grant towards the printing of the book; the place and no doubt past pupils have so many connections with the National Park it was fitting that we were able to assist. Northumberland National Park covers more than 400 square miles of awe inspiring landscapes from Hadrian’s Wall World Heritage Site in the south, to Kielder Water and Forest Park in the west, then northwards to the Cheviot Hills along the Scottish Border. Our Action Area fund is suitable for small projects that will make an immediate difference and enables local people and community groups within the park and our gateway settlements to conserve, enhance, enjoy or understand the landscape, culture, traditions, wildlife, history, place and communities. The book is about to go to the printers, fingers crossed there are no last minute hitches. The extra funding needed to help with the publications cost for the BRS book, has at last come through. So it shouldn't be too long before it's ready. I will keep you informed as soon as I hear anymore. Pat Goonan (formerly Ilingworth) Funeral Arangements see "Obituaries Page." 1/ Sadly one new anouncement in the "Obituaries Page"
2/ Anyone remember a French teacher at Brownrigg? Then maybe you can help---go to "Find A Friend"
Si vous lisez ceci, alors peut-être? 3/ New message from Alan Long 1949/50------" Guestbook." I have added a new page for and supplied by Trevor Suckling, St Cuthberts Church Bellingham (The Long Pack). Many pupils attended this church and others in Bellingham as part of the BRS education/life. So I hope their news letters will jog memories of when you attended or skived off for other more pressing matters or clandestine meetings!!! Any other churches in Bellingham are welcome to send me information or appeals to post on here. "New corresondence from Chris Burden 1959/61---in "Guestbook", and Roly Brown 1960/63 and Keith Scott in "Find a Friend." Dukes House Wood School near Hexham. 1/ The Heritage Centre have appealed locally for extra funding/donations and are fairly confident that they will obtain it very soon. The extra funding is needed to offset the rising costs involved for printing/publishing---nothing cheap these days! 2/ New appeal from Dave Foster in Guestbook/Appeals/Find a friend Page. As far as I understand The Heritage Centre are seeking more funding for the book and are currently trying to obtain that extra funding to help cover publishing/printing/postal costs. Pat Batey has already started to help by obtaining a donation from Bellingham Village Council. More news when I get it. I hope to start sending out the Happy Hiker via the BRS Website very soon. Ed Graham will let me know who are paid up members of the BRSS, and I will issue passwords/user names to give these people access to the Happy Hiker page. The password and user name will be sent direct via email. We think it will be cheaper (saves postage) for UK members to pay directly into the BRSS bank account. Or they could send a cheque or hand payment in when possible. The cheapest way for overseas members to pay is for them to send a cheque, otherwise bank charges will occur via bank transfer or they can hand over payment when convenient. For those members who prefer a hard copy that system will still be available, but it is getting more costly with the increased printing and postal charges which take a large lump out of the funds. More people checking in on the website including Ex BRS Steven Mavin formerly from Ashington who found his way to America, must be a story there. Steven has provided some photos from his era and you can find them in the 1940s photo section. I will be able to add some information later. I borrowed the above photo from his email to me (hope you don't mind Steven) and thanks for the photos. Just back from a much needed holiday to Malta ! !--- Normal sort of holiday area if you are 16 to 20yrs old--NOTE-- Must Check the hotel next time before I book. Had a new visitor to the site while I was away---see below. If anyone would like to contact Tom send me your email and I will pass it on to him. little late for your reunion unfortunately. I have sent off copies of the photos I have suggested from the archives, for illustrating in the new book. The Heritage Centre will be calling a meeting shortly to get opinions from the Reunion Committe of which photos are most relevant/interesting. I have included as many as I can to broaden the choice but the final decision may be with the designers. I had a meeting today with Ian Robertson at the Heritage Centre to discuss the next stages of the BOOK. My Task-- I will shortly be sorting out a selection of photos from the archives to illustrate the book, and then a further meeting is planned with members from the Brownrigg Committee to help choose which photos will be used for illustration purposes. It looks like an Easter 2013 deadline is planned for publication--fingers crossed. I have read the updated version which is very close to what will be the final accepted draft, ready to print once the photos are selected. This book will be a record of the school, how and why it came about, plus lots of stories from ex Browriggers and a lot more. In other words, about 17,000 of them, a written lasting history of the school available for all to see for years to come. I also now have more photos, including some coloured, from a former teacher at Brownrigg , a selection of which I will load onto the 1970s section for comment. I hope to contact her ASAP and glean any further information to add to the archives and will let you know the outcome. I have been inundated with enquiries, almost on a daily basis, regarding the progress of the proposed Brown Rigg Book which, to many peoples disappointment and frustration, has yet to appear. Unfortunately, the book is taking longer to put together than most people anticipated and, although the order form circulated at June’s Reunion stated “The booklet will be forwarded to you at the end of Summer 2012” I am afraid those waiting for a copy will have to be patient for a little while yet, the latest projected publication date that I have heard being sometime between the New Year and Easter 2013. It should be pointed out that the publication is, in fact, being produced by Bellingham Heritage Centre, it is not a project of the Reunion Society and consequently we are relying on another organisation to handle the production and distribution. The delay seems to be due to the fact that the person editing the book is looking for additional content. Initially he was supplied with a huge amount from the back copies of the Happy Hiker whilst the work which was done for the original version of the display panels that went into the railway carriages was also made available. The books editor felt, however, that he needed more input about girls activities and from Brown Rigg’s later years and obtaining this has, it appears, been time consuming. I will attempt to keep folk updated as to the progress of the book and what is happening, keep an eye on the Brown Rigg website and on our page on Facebook. A new photo from Graham Davison on permanent holiday in Oz, I'm not sure if that's his private plane in the background as well !!!!! Come on the rest of you out there, if you want your story told or are just proud of where you live, share it with us, send it to me. You will see a new section HAPPY HIKER at the bottom of the pages menu on the left hand side. I will shortly be trying with Ed Graham to bring you all the option of having the Happy Hiker available on this website. We also hope to load all the Happy Hiker back issues but this will take time. Due to increasing postal costs it makes sense to go down this route, and it will in the long term help to keep running costs down. When this page is up and running, access to the page will be via a registration name (email address)/password, and with your normal subscription paid via a secure payment procedure, to the BRS account. A password for this page will be issued to you. Anyone who tries to open this page will be asked for their name/password. Access to all the other pages will remain open to anyone who visits this website only the Happy Hiker page will be locked. I know not everyone is computer wise, and may still want the Happy Hiker sent via post as normal, and for these people that option will still be there. Let me have your comments!!!! We have a new class/dorm photo from Michael King from the 1970s it's in the 70s/80s section, take a look and see if any of your mates are on there. If you have photos especialy from the 70s/80s I would love to have them on here. Also just found an entry that I had missed from Lynne Barnett (nee Armit) BRS 1968 and I have entered this in the Guestbook section, see if you remember her. I'm back after burning in Bulgaria for 3 months, no rain to speak of, the country was in a serious drought with temperatures never less than 30c and up to 50c. Lots of crops lost including potatoes, fields of sweetcorn and sunflowers and to think the UK had floods and the wettest summer on record. So now I can get back to some work on this site----hope to hear from some of you. We have recently purchased a laptop and added to this another one on loan from Syd Graham for use at the reunion weekend. These laptops will be available for you to use at the Heritage Centre. I have downloaded to these laptops our current archives of most of the photographs that have been donated. There are more to download and I have know doubt this will be ongoing. One of the laptops will remain permanently at the centre for visitors to use. Forms will be available for you to name any of the persons in the photos to add to the database. It's been a long task compiling all the photos, so please use this facility to view the school history, as it will in the long term help preserve the donated photos in their current state. 2012 Reunion----Progamme of events now on the 2012 Reunion page. I have written to the Woodhorn Museum recently, and put forward the idea that all the school documents and memorabilia that they have in their records office would be better accessed, if they were all joined together in one collection. Namely if they were all transferred or even copied and sent to the Heritage Centre at Bellingham, as this seems the more natural place now to house a complete collection along with the permanent display and Heritage Centre collection. I will keep you posted on any response that I get back. Also what do you think of the idea???? Let me know! As you can imagine things are getting a bit hectic in readiness for the 2012 REUNION and of course the added ongoing work with the HERITAGE CENTRE has made it a hard year thus far. I have added some more photos to the Heritage page and more will follow. Also I have added a 2012 Reunion page to keep you all up to date with progress, from meetings etc,just to give you an idea of some of the work involved and the latest news. It's at times like these when I am reminded of all the hard work done for previous reunions by all the volunteers, a big thanks to you all. I attended the opening ceremony along with my partner Rosie and members of the reunion committee. There was a fairly large crowd including Fiona Hall MEP who I think was there to see just what some of the EU money was spent on as well as the Lottery Fund money. A tea was laid on for us in the new tea rooms and I have to say the snacks were tasty, good quality, and if this standard is carried on it will be a very popular venue. The display in the classroom section includes "The Wannie Line" along with the BRS display and memorabilia. More photos on the Heritage page. There is a good almost full page spread in todays Newcastle Journal, page 26, about Brown Rigg and the Reunion and Exhibition by journalist Tony Henderson. I have tried to find it online but so far failed. Just found out that, owing to a bookings mix up, there are lodges to rent at Brown Rigg for Reunion Weekend. The lodges are in what used to be the Science Block but don't let that put you off, they are beautifully appointed with every convenience imaginable. Each one sleeps six people and they will make a marvellous base from which to enjoy all the weekends Reunion activities. If you are looking for accomodation for Reunion Weekend then give Morag or Richard a call, they will be glad to hear from you, don't forget to say you are coming for the Reunion. Phone nember is 01434 220272 or e-mail [email protected] or copy and paste the website below into your browser. More reunion photos uploaded to Skydrive----YOU CAN ADD-- names at the bottom of the photos and number of years at BRS and dorms? Two new additions in the "Guest Page" and sadly one new entry in the "Obituaries"
Hello Folks, a few things to update you with---The exhibition panels are about to go to the printers I think this week. The Heritage Centre brought in a designer who specialises in this sort of work, who has almost completely redesigned the panels with mainly the interests of the general visitor in mind. Ed Graham and I worked on the panels on our own for some time, despite appealing for contributers none were forthcoming. Naturally we told the story of Brown Rigg from our aspects and while this is very interesting to ex Browriggers, the same may or may not be said from the casual visitors point of view, hence the museums need for redesigning. Having said that, the panels look very good and will add to the Brown Rigg experience. The good news ---We have at last got a much needed information panel contributed from the girls showing their side of Brown Rigg, so lads (I never knew this went on) you need to look at this! Also I have been invited along with a few others to to the opening very shortly of the carriages, ready for the new tourist season starting. ---A new photo showing progress, has been added. Also I have at last started to add photos from the "Reunions" collection to "Skydrive" on the links page. New appeal on "Guest Page" from Diane Ince 1970--80s. The BRS display panel designs are completed and ready to go to the printers to actually make the panels for the display. I may be a bit biased but they look fantastic and will make a vivid lasting display of the life of the school and occupants. Where do you live or holiday page------ A new story and photos from Brenda Docherty who emigrated to Canada some years ago. Brenda was at Brownrigg in the late 50s and will be at this years reunion. New photo in the "50s Pupils" folder all the way from The Northern Territories, supplied by Anne Parry, but we need the surname of Irene ? Do you know it, if you do then let me know so I can complete the record. I have deleted the Blog page as it was rarely used and most people seemed to want to use Facebook or Twitter. MEETING @ HERITAGE CENTRE 25. 11. 2011. Notes of the meeting to follow shortly in the meantime 2 new photos of the insides of the carriages. Some of you may not think it but a vast amount of volunteer work was needed to get to this stage. On the Heritage page. The last of the 80s photos are downloaded. Also can anyone tell me the era/riders in the b/w photo or the names of the horses? Also I have added another link & more images to our Skydrive storage, it's on the LINKS page under "Brownrigg schoolbuildings internal and external". One is an interesting photograph of the school taken from the air by--- 41(F) SQN--- of the school in its transition stage to caravan site/lodges. The other is a drawing of the school by the talented ex BRS pupil Peter Middlemiss. Reluctantly I have added an "Obituaries Page" I suppose it's the only certainty in life and needed adding at some stage. Anyone wishing to add comment or make an announcement on this page, please use the "Guestbook" page to enter the information where I can edit/copy/check/confirm where possible, and move the message to the Obituaries page. AT LAST----- The 80s at Brownrigg did exist-- We have some photos with names----Kathleen Robinson--Jackie Hearn--Little Mini--Jock---Catherine Mansfield (Chippy) and the horses---Cinders--Sorrell--Prince. If this helps to bring back memories then get them to me ASAP or/and use the website to get in touch. Ed Graham is hoping to design a display board for the Heritage Centre with these photos to show the schools riding centre, are there anymore photos out there??? I will upload all of the photos as soon possible, in the meantime I have stuck in a few to start. We will be having a meeting, late November at The Heritage Centre to possibly finalise the design of the last of the display panels. So now is the very last chance for anyone to submit anything you would like to be considered for inclusion. Is there anyone else out there !!!!!!! do you go on holiday, do you live in place you are proud of ? Come on, send me you photos so we can show them on your website. WE VERY URGENTLY NEED PHOTOS/STORIES FROM THE 70s AND 80s for the display ----if you know someone out there who was at Brownrigg, Teachers or Pupils or any staff, PLEASE get in touch with them. 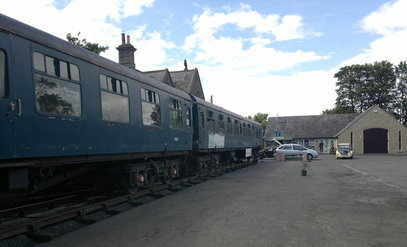 26th Sept 2011 -Latest meeting at the Heritage Centre from Ed Graham and updated photos of the carriages from Pat Batey. Because of the developments with the Brownrigg Heritage Project I have started a new page for this subject. 29th Aug 2011 Another ex Brownrigger saying hello in the Guestbook --someone send a reply??? I am now well on with the downloading and editing of the BRS PHOTOS for the Heritage Centre and BRS display. BUT what happened after 1964 ????? there are no photos between 1964 and 1976 WHY? and then only a very few up to 1980. Can anyone enlighten me as to why this is, or better still if you do have any photos and memories, lets have them so I can record them for future generations. Continuing with this story -- Just arrived, photo of a train at Bellingham Station? I think the last train at Bellingham Station was about 50 years ago. New Photo, it's a long hard process converting these 35 ton monsters. 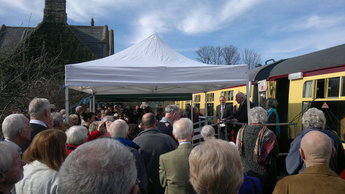 This is the two carriages at the Heritage Centre, that will be converted and used as a classroom and a tea room. The BRS Reunion fund has made a donation to this project and a display of our school photos and artefacts will be permanently displayed in the classroom. This is partly funded by the National Lottery. Ed Graham is currently putting out the begging bowl to ask ex pupils to donate towards this permanent display. So if you would like to donate towards a lasting memory of your schooldays, please contact Ed or any of the commitee members. Or how about organising a garage/car boot/sale to raise funds. We need to raise some funding so lets have a go, it's not a lot of money needed for an everlasting memory of your schooldays. Just think your grandchildren and their children will be able to see for themselves just what it was like, and with the increasing interest in ancestry who knows who will be visiting this centre for information about the school, for possibly generations. And, I would still like to add some life/achievement stories at the same time---let me know what you think????? We have Brownriggers in almost every part of the world, there has to be some interesting stories out there. We are going to need them. Achievements/Life stories -- Lots of you have some very interesting stories about your lives after Brownrigg. Lets read about them and show just how the school changed your lives. just to keep you all interested, you will need to check the whole of the site when you log on, in case you miss something. New--I am currently testing and probably sticking with "Skydrive", mainly because it offers fairly large and free storage for photos. Try the photo links page. Too many photos albeit that they are resized, simply leads to pages loading slowly and spoiling the enjoyment of the site. If anyone has any other ideas for the future, then please let me have them.